Niagara Falls, one of the most well known breathtaking attractions you’ll ever see, is just 1.5 hours from Toronto. 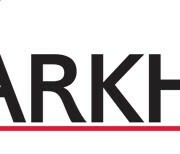 Why not take this opportunity and take a day tour with one of Toronto’s Top Niagara Falls Tour Operators? The Niagara Falls Tour is a full day tour. King Tours will pick you up from your hotel lobby between 8:10 to 9:00 am, and you will be on your way to Niagara Falls at around 9:15 AM. We expect to return to Toronto around 6:15 to 7:00 pm, so if you are planning on making dinner reservations after the tour, we recommend to make them after 7:30pm. Our Tour Guides are Licensed by the Niagara Falls Parks Commission. Enjoy a stop at a Niagara-on-the-Lake winery and enjoy a complimentary tasting. 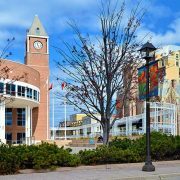 The premium full-day tour of the Falls starts with your hotel pickup between 8:10 and 9 a.m. On our first stop we’ll have time to explore Niagara-on-the-Lake. Niagara-on-theLake is a picturesque town just a few minutes drive outside of Niagara Falls. You’ll enjoy 40 minutes of taking pictures and exploring some of the unique shops. Before you actually reach the Falls, we’ll also see the Floral Clock, Niagara River and whirl pool, Sir Adam Beck Power Station, Queenston Heights, and the Spanish Aero Car. Our licensed Niagara Falls Tour Guide will point out all the interesting sites and inform you about the history of the region. During the day, we will make a stop at one of Niagara Falls’ famous wineries. There you will have an opportunity to sample a wine (on us) before continuing our Niagara Falls adventure. Don’t forget, we offer a tour package that includes Niagara Falls’ #1 attraction, the Hornblower Boat Ride! 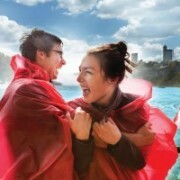 The Niagara Falls Tour with Hornblower is our best selling tour. The tour is structured to give you 2-3 hours of free time at the Falls. This gives you plenty of time to add in additional activities such as the Skylon Tower and the Journey Behind the Falls on your own time and budget. We start to depart Niagara Falls between 4:00 – 4:15 pm. Sit back relax, enjoy the free WiFi and relive the day’s memories on the bus ride back to Toronto. Choose from the tours packages. Each includes door to door pick-up and return. This is our most popular tour package! Bypass the General Public line-up and board the Hornblower Boat Ride. Get as close as possible to the breathtaking flow of water, power and mist of the magnificent Niagara Falls. This is a full day Niagara Falls tour exactly as described above except it does not include lunch or Hornblower boat ride. This is ideal for individuals who prefer convenience of a bus tour, but also want to discover things on their own. 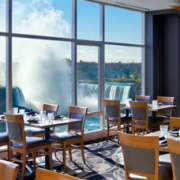 This package includes an all-you-can-eat buffet lunch overlooking the Falls at Sheraton Hotel. 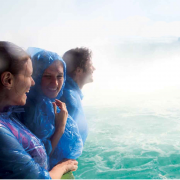 Niagara Falls Tour + Hornblower + Lunch at the Sheraton Fallsview = the most exciting day of your life. This is a full day Niagara Falls tour includes pick-up and return from Mississauga and Toronto Airport area hotels. The tour is exactly as described above except it does not include lunch or Hornblower boat ride. This is ideal for individuals who prefer convenience of a bus tour, but also want to discover things on their own. This is a full day Niagara Falls tour includes pick-up and return from Markham, Thornhill, or Richmond Hill area. The tour is exactly as described above except it does not include lunch or Hornblower boat ride. This is ideal for individuals who prefer convenience of a bus tour, but also want to discover things on their own. Skip the winery visit, wine tasting, Niagara-on-the-Lake, and go directly to Niagara Falls. This tour package departs from downtown Toronto at 9:15 am and returns to Toronto with our courtesy vehicle at approximately 4:00 pm. You will have 2-3 hours of free time in Niagara Falls, enough to take the Journey Behind the Falls, have lunch, or board the Hornblower Boat Ride (seasonal). This is a full day Niagara Falls tour includes pick-up and return from from Brampton Ontario. There is still room on tomorrow’s tour. Book now!